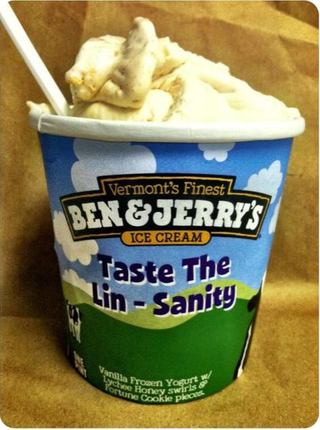 First, Ben & Jerry's hopped on the Jeremy Lin bandwagon with its "Taste the Lin-Sanity" flavor, featuring crumbled up fortune cookies. Then Ben & Jerry's took a few steps back and swapped the fortune cookies out for waffle pieces after a "bit of an initial backlash" about the fortune cookies. The main reason for the switch according to a spokesperson was, obviously, that customers were complaining the fortune cookies were soggy. Now, the company has issued an apology for everything—delicious racism, soggy fortune cookies—everything. "On behalf of Ben & Jerry's Boston Scoop Shops we offer a heartfelt apology if anyone was offended by our handmade Linsanity flavor that we offered at our Harvard Square location,'' the company said Saturday on its BenJerryBoston Twitter account. Ben & Jerry's: We may give our ice cream flavors racially insensitive names, but that is handmade racially insensitive ice cream.